A collection of memories of Chris Mavraedis, who has loved baseball and the San Francisco Giants since he was a boy. Battling Lou Gehrig’s Disease since 2009, Mavraedis began writing and translated his passion for baseball into stories, blog posts and emails which form the basis of this book. 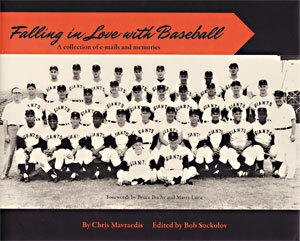 Features 24 stories and great photographs from the Giants archives. Forewards by Bruce Bochy and Giants broadcaster Marty Lurie. Proceeds benefit the ALS Foundation. Hardcover. 79 pages.